I want a tagine for no other reason than it looks cool. There, I said it out loud. A few years ago, Williams Sonoma had a gorgeous Moroccan cookware display in their window in San Francisco's Union Square. I stood staring, transported to a land of crowded marketplaces, little cups of strong coffee, and gorgeous architecture until someone pushed daydreaming me out of the way (in their rush to Starbuck's undoubtedly). That's when I decided if I couldn't go to Morroco, I'd do the next best thing- get a tagine. I wasn't sure what I'd use it for but I knew I was getting one. Granted, if I had one, I'm sure I'd be inspired to use it but let's be honest, it's not a product I'd purchase because I have a pressing need for it. Sadly, I have not gotten one because I recognize this. I think that's a victory in and of itself. It's also because the kitchen gadgets have now overtaken our coat closet and linen closet. So a few months ago, I made a rule. I couldn't buy a kitchen gadget until I had at least five ways to use it. Unfortunately, wearing the tagine as a hat does not count as one of the ways. This is the best, first, and most often way I'd use my tagine. Beef Tagine with Chickpeas and Apricots (recipe at the end of the post). It's adapted from a bunch of recipes (including a Williams Sonoma one which uses lamb) tweaked by yours truly. Plus, a dear friend asked for a recipe that wouldn't take hours of prep work so I'm dedicating this to MA, who is a superstar-attorney, mother, and all-around fabulous person. This is a super versatile recipe. In the past, I've substituted chicken and even eliminated the meat altogether (though the latter option wasn't so popular in a staunchly carnivorous household). I've also used golden raisins when I don't have dried apricots on hand. Sometimes I toast and grind my spices, sometimes (particularly after a long week of work) I use bottled spices. Will your spices taste better if you toast them whole and then grind them? Sure. But your meat will probably taste better if you raise your own cow or lamb. Cooking great food is about rocking out within your time and budgetary constraints. Over time, you will enjoy cooking such that you will make time to toast and grind your own spices. Until then, regular bottled spices from your local grocery store will do just fine. I'm almost certain this dish tastes equally delicious made in a regular cast iron pot (like I did) or a tagine. But that don't matter because I'm counting it as one of the uses for my yet-to-be-purchased tagine. Now I only need to find four more uses! Heat oil in pot and brown beef on all sides. Transfer to a plate. Heat more oil and cook onions in the same pot until translucent. Add ginger, garlic and spices. Add a splash of water, if necessary (you want to cook the paste 2-3 minutes until fragrant). Add beef, stock, tomato product, and cilantro to pot. Cover and cook for 1 1/2 hours on low heat. Add chickpeas, apricots, and lemon juice and cook for another 30 minutes. Remove lid and bask in the delicious aroma (this step is important). Make sure your meat is tender. If not, continue cooking for a few more minutes. Do a quick taste test and adjust seasonings, if necessary. I tend to undersalt until the last step because I figure, I can add more salt but I can't really take any out. Garnish with cilantro and serve with couscous or basmati rice. And then, pat yourself on the back for a job well done (this step is also important). 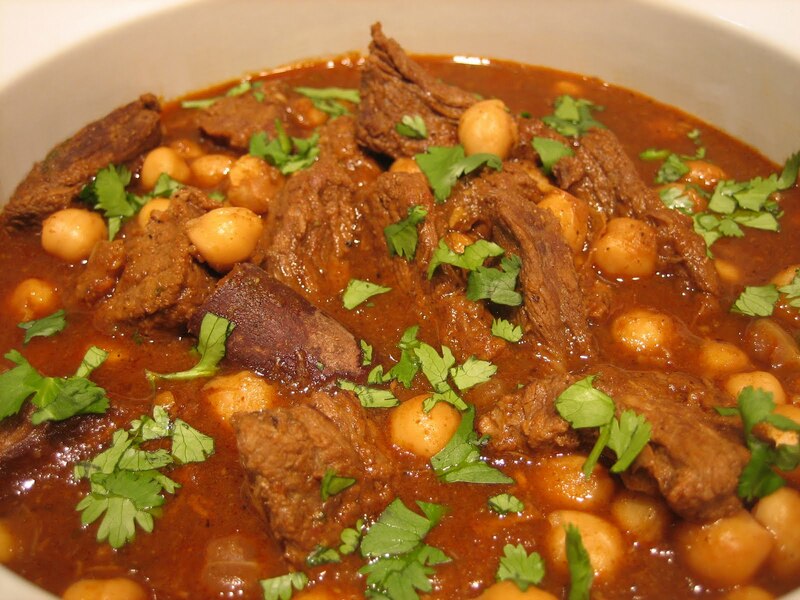 I have an awesome tagine recipe from the book "Tagine" that I can send you. I made it for Craig and his partner Michael. I will send it your way. Now you only need three more recipes! This recipe looks fantastic! I am a lover of all ethnic foods and intrigued by all cultures. I will be sure to list your blog as a favorite and check back. Aren't Tagines fantastic?! Azmina....I agree. Kitchenware has to have multiple uses. May I make a suggestion? I was reading a cook's illustrated article on tangines a few weeks ago. 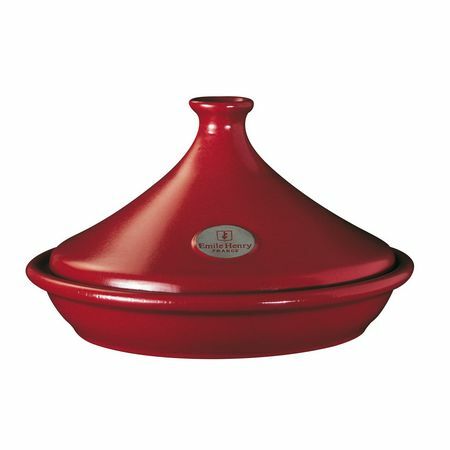 A better vessel would be the Dutch oven which has the same properties as a tangine but many more uses. I use mine at least 2-3 times a week and it's also great for bread making. You don't have to get Le Creuset which is the mot expensive. I own the Lodge. It's just as great (cook's says so) and a lot less expensive. Discovered this great recipe just before Christmas, ande made it as part of our "big meal". It came out amazing! Thank you! We do have a Le Creuset Tagin, got it as a gift, and tired chicken tagin before but not as tasty. But for the Christmas meal we used our cast iron dutch oven instead because the Tagin is too small for the portion we needed.